This beautiful new home is conveniently located in the desirable Southwood community, a wonderful true neighborhood with NO HOA, south of Loris. This Floor Plan is over 1600 square feet of living space consisting of an open floor plan with cathedral ceilings, laminate floors with upgraded carpeting in the bed rooms. Also all wood cabinetry with soft close drawers and doors, multiple storage closets, island kitchen, Amana stainless steel appliances, Beautiful glazed paver tile backsplash and more! The large master bedroom and bath features a large step-in shower, marble sink and vanity, and a spacious walk-in closet. Exterior features include carraige style garage door, sodded yard, shrubery, concrete drive, entry sidewalk, and more. Enjoy your afternoons on the large front porch and a stroll, jog or bike ride with your neighbors in this delightful community. 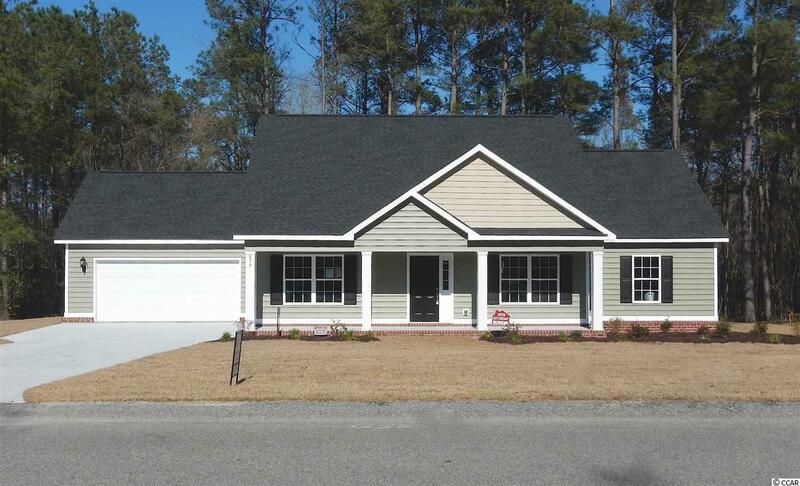 Southwood, located just outside of Loris SC, is now offering custom built homes for a comparable price as a small lot and home in a cookie-cutter subdivision. Come and see all the extras that this home has for you as well as the options on new construction. Enjoy year-round outdoor actives and just minutes from the beaches. Other floorpans and lots available. Measurements are approximate and not guaranteed. Buyer is responsible for verification.